Best Deep Fryer - How to Choose and Which One is Best for You? The FryDaddy is an economical fryer that’s sized perfectly for small families of 1-2 members. Presto knows that oil can be expensive, so they designed the FryDaddy to save you money on oil. It uses a 4:4 food to oil ratio, which means you can fry up four servings of food with only four cups of oil. This deep fryer is not only economical when you buy it, it saves you money in the long run as well. The FryDaddy is so easy to use, you don’t have to worry about setting the temperature. It’s got an internal thermostat that’s preset to the perfect frying temperature, so all you have to do is turn it on and let it warm up. Once it’s hot, just add your food and cook for the correct amount of time. The FryDaddy is one of the easiest fryers to clean on the market. The entire appliance is coated with a nonstick surface both inside and out, so nothing gets baked or stuck on to it. Cleaning is as simple as a simple wipe with a soapy cloth or sponge, and then a quick towel dry. The FryDaddy is not dishwasher safe, so don’t try it. One of the most useful features with the FryDaddy is the snap-on lid. All you have to do to store this deep fryer after using it is allow it to cool down, and put the lid on. You don’t have to deal with any odors from the oil, or any messy oil spills. Just put your FryDaddy aside until you’re ready to use it again. You can read our Presto FryDaddy Deep Fryer review here. If you’re looking for a deep fryer that’s only slightly larger than the FryDaddy, Presto’s GranPappy may be just the right size for you. The GranPappy deep fryer has a slightly larger capacity, coming in at six cups of oil. With Presto’s one to one ratio formula, that means that you can make six cups of fried food in each batch with the GranPappy fryer. If you are looking for a larger deep fryers that can cook two different foods at the same time, check out our Presto 05450 DualDaddy Electric Deep Fryer Review. The GranPappy fryer is powered by a 1500 watt heating element that runs off of North American standard 120 volt power at 60 hertz. Preheat time is about 15 minutes once you plug it in, and no temperature adjustment is required with the internal thermostat. Just plug it in and heat it up, then you’re ready to fry. A great feature found on the GranPappy fryer is the magnetic power cord. If the appliance happens to get jostled around, the magnetic cord will disconnect, automatically shutting the unit off. This prevents any unwanted burns and eliminates any danger of grease fires. You can read our Presto GranPappy Deep Fryer review here. The CDF-100 is Cuisinart’s compact model in the deep fryer market. The CDF-100 is listed at 1.1 liter oil capacity, which is equivalent to 4.6 cups of oil. This is a perfect capacity for two people, and the removable fry basket can hold up to ¾ of a pound of food for each batch. You are in control with the Cuisinart deep fryer. A rotary dial allows you to set the temperature to the desired setting, giving you complete control over your food. Maximum temperature is 375 degrees Fahrenheit for restaurant quality results. The real draw of this deep fryer is that it is such a small, compact package. It doesn’t take up much counter space, so for those with smaller kitchens, this could be the perfect deep fryer. For your reference, the dimensions are 7.5 inches by 8 inches by 11 inches, or slightly larger than an average sized toaster. You can read our full Cuisinart CDF-100 Compact Deep Fryer review here. This deep fryer will remind you of a scaled down version of restaurant style fryers. What makes this fryer work like a commercial one is the stainless steel fry basket. You simply add up to six cups of your favorite food to the basket, and submerge it in the hot oil. When your food is done cooking, simply raise the basket up and allow it to drain, and your fresh fried food is all ready to eat. The biggest safety feature on this deep fryer is the lid. You can keep it closed while you cook, which eliminates the possibility of any splattering which could result in painful burns. What’s even better, the lid can stay closed while you drain the fry basket, making this fryer even safer. You’ve got to try pretty hard to sustain a burn using the Hamilton Beach deep fryer. The lid reduces the possibility of oil splatters, and the outer shell is made from Cool Touch material that never gets hot, so you don’t get burned. Using the Hamilton Beach deep fryer is much safer than using traditional pots and pans, plus it’s easier and your food will taste better. You can read our full Hamilton Beach 35021 Deep Fryer review here. If you want a deep fryer that looks like it could work in a drive-in, check out the FR4049 from T-fal. The T-fal FR4049 requires 3.3 liters of your choice of oil to fill up the reservoir before use. With this much oil, you can load up the fry basket with 2.6 pounds of your favorite food, cooking up large batches or smaller ones if you wish. The controls on this deep fryer are simple to understand and use. The left hand dial is a timer that you can set for up to sixty minutes. The right hand dial is a temperature control that allows you to precisely set the temperature for each particular recipe. Used in combination, these dials allow you to make the best fried foods exactly according to each recipe you love. This deep fryer is one of the easier ones to clean. The stainless steel fry basket and frying pot are both dishwasher safe, so after you drain your dirty oil you can just pop those in the dishwasher and they’ll be taken care of. The rest of the fryer can be wiped down with warm soapy water for best results. You can read our full T-fal FR4049 Family Pro Deep Fryer review here. If you need to feed a large group of people, a small capacity fryer won’t cut it. You need this professional style deep fryer. This deep fryer is designed exactly like the ones used in real restaurants. There’s nothing extra here, so you don’t get a lid or splash guards. What you get is a large vat of oil with a submerged heating element and two fry baskets. Each fry basket can hold up to six cups of food at a time, so the total food capacity with both baskets full is 12 cups for each batch of fried food. With this capacity, you can fry up some pretty serious quantities of fries, nuggets, onion rings, or whatever else you’re cooking up. This fryer will allow you to feed an army. The control panel here is simple but user friendly. A large red indicator tells you when the fryer is on, while a green light will tell you when you’ve reached your desired temperature and it’s ready to fry. A built-in timer allows you to keep track of your cooking time, and the temperature dial allows you to select the proper temperature for your food. This fryer is easy to understand and use for everyone. You can read our Hamilton Beach 35034 Deep Fryer review here. This deep fryer from Secura gives you the option of frying up large single batches, or two smaller batches of food. You get options when you choose the Secura deep fryer. It comes with three stainless steel baskets so you can fry three different ways. You can fry a single small basket of food, a single large basket, or you can fry two small baskets side by side. Versatility is the name of the game with this deep fryer. Secura fitted this deep fryer with a powerful 1700 watt heating element that is fully immersed in the oil. This powerful unit allows the fryer to preheat quickly and recover to the desired heat setting quickly after food is added. When you submerge this element in 4.2 liters of oil, you get a large capacity frying machine. The controls on this fryer are relatively simple and easy to use. Using the temperature dial, select the desired heat from 250 to 375 degrees. Once the oil is preheated, the green ready light will come on to tell you the fryer is ready. Add your food and set the timer to the desired amount of cook time, up to 60 minutes. That’s it. An additional red light indicates that the power to the fryer is on and it may be hot. You can read our Secura 1700-Watt Triple Basket Deep Fryer review here. The Pro Fry deep fryer from Presto is a commercial quality fryer that is surprisingly affordable. If you’ve got a large event coming up that requires a large amount of fried food, this is clearly the deep fryer for you. It has two rectangle shaped baskets that are equipped to handle 12 cups or 5 pounds of food, so you can make huge family-sized batches of deep fried food. The long fry baskets are also ideal for cooking large items like chicken breasts or fish. The heating element on this fryer is among the most powerful you can buy for your home. It’s a staggering 1800 watts of heating power, fully immersed in your oil. This kind of power ensures rapid preheat times and almost instant recovery after you add your food to the preheated oil. A high wattage fryer is always the best, and this fryer delivers. Cleaning up this deep fryer is about as easy as you could hope for. After you drain out the old dirty oil, you can easily remove the heating element and the fry pot to clean. Warm, soapy water is the best cleaner for these parts, as well as the fry baskets, but you can put those in your dishwasher if you want to. This deep fryer is a cinch to clean up. You can read our Presto 05466 Dual ProFry Deep Fryer review here. If your oil condition is important, the T-fal FR8000 has some great features to keep it clean to save you money. This feature makes it easy to store oil from a deep fryer. The FR8000 has a unique oil filtration and storage system. After each use, you can select the filtration setting, and the oil will be filtered and stored in a drain compartment underneath the unit for the next use. Simply clean the fry pot, and the sediments will all be removed from the system. Plus, your oil is stored in a sealed container so you can’t possibly spill it. The T-fal FR8000 is a medium sized deep fryer when it comes to capacity. It holds 3.5 liters of oil, and it can cook about 2.65 pounds of food at a time. That’s about enough for 3 to 4 people max, and only 2 if they’re big eaters. You can always cook smaller batches with this fryer, but you can’t make bigger ones, which may be an issue. Cleaning up the T-fal fryer is probably the easiest in this group of fryers. The entire machine comes apart, and once you disassemble it, all of the parts are dishwasher safe. Take off the lid, fry basket, fry pot, and remove the oil storage container and place them in your dishwasher. That’s it, other than a quick wipe down, you’re done. You can read our T-fal FR8000 EZ Clean deep fryer review here. This deep fryer from Waring features more advanced controls than the rest of this group. Unlike all of the other deep fryers reviewed in this group, the DF280 features a fully digital display and controls. Set the timer, temperature, and turn the unit on or off using the backlit digital display with push button control. Simple up and down arrow operation makes using the control panel simple, but it looks great and eliminates any errors associated with old dial control knobs. The Pro DF280 comes with three baskets for your convenience. They are all made from heavy brushed stainless steel, so they’ll last a long time and are dishwasher safe. You get one large fry basket and two smaller ones, so you can choose to cook a single food in large quantities, or two different foods in smaller quantities. The choice is up to you. 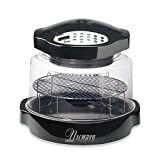 The feature that makes this deep fryer stand out is the unique fry pot design. The pot on this fryer is made of stainless steel. It holds up to one gallon of oil, and it has a handy pouring spout that makes it much easier to pour out used oil after you’re done cooking. The best part of the stainless steel construction is that you can throw it in your dishwasher to clean it. You can read our Waring Pro DF280 Professional Deep Fryer review here. The first item to consider for your new deep fryer is capacity. This is usually expressed in the amount of oil the fryer holds. For example, common sizes are one liter and 3 liter. The more oil a fryer holds, the more food it can cook in one batch. Small families of one or two people can use a smaller fryer just fine, but larger families will need larger capacity fryers. The power of a deep fryer is usually expressed in watts. Higher wattage fryers get hotter faster, and usually the cooking time is shorter as well. Generally speaking for a deep fryer, the more watts the better. This is a function that’s usually related to power. Look for a deep fryer with a short preheat time, so you can get to cooking faster and spend more time with your family. If the information isn’t readily available, just go by the wattage of the fryer. A deep fryer with a wider temperature range is more versatile. Always look for the fryer with the widest range, so you can cook every food that you want to. When deep frying, higher temperatures are better, so look closely at how hot each deep fryer can cook. When you deep fry foods, the oil you cook in gets dirty. To help make your oil last longer, fryers usually have an oil filtration system to remove any sediments. Proper oil filtration makes sure your food tastes good and saves you money from buying oil since it lasts longer. Make sure your new deep fryer has a filtration system. Deep frying foods can be a risky task. Hot oil, surfaces, and foods are an easy way to sustain some serious burns. Look for fryers that have safety features like cool touch handles and exterior, splash protection, automatic shut-off, rubber feet to minimize slipping and spills, and electrical protection against shocks. Safety should be your number one priority at all times when using a deep fryer. Every buying decision involves price to a certain degree. My advice is to establish a maximum amount you are willing to spend on any item before you begin shopping for it. After you determine the amount, you need to stick to it. There are many great deep fryers available on the internet for low prices, so don’t be afraid of a good deal. Just compare price, warranty, and features and you’ll be ok. Some deep fryers such as T-fal FR8000 EZ Clean Deep Fryer is easy to clean because we can just remove its parts and put them in a dishwasher. If you do not want to clean a deep fryer manually, look for one with dishwasher safe parts. If you’re in the market for a new deep fryer for your home, you can’t go wrong if you choose any one of the fine fryers reviewed above. However, I always like to name a winner when I review a group of products. For this group, I’ll name two winners. One will be for the smaller sized fryers, and the other will be for the larger ones. For the 1-2 person sized deep fryer, my winner is the Hamilton Beach 35021 Deep Fryer with Cool Touch. It’s got the best capacity and the cool touch technology makes it the safest fryer to use in the bunch. For the larger capacity fryers, my favorite is the Presto 05466 Dual ProFry Immersion Element. It has the biggest fry baskets of the group, so you can fry whole fish and chicken breasts if you want to. Plus, I like the powerful 1800 watt heating element and the no-frills design. While all of these fryers are quality products, these two are the best value for your hard-earned money. What is The Healthiest Oils for Deep Frying?